This new title forms the fourth in the popular 'Steam Trails' series. The lines covered in this new volume are predominantly those that were operated by the Lancashire & Yorkshire Railway, and so routes like the main line from Manchester to Leeds via Summit tunnel and its associated branches also feature. 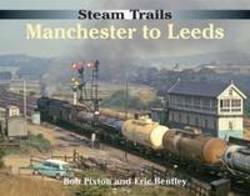 The late Eric Bentley was a prolific photographer of railways in the area between Manchester and Leeds during the final decade of steam operation. His collection includes both colour and mono images, the vast majority of which are previously unpublished. His comprehensive records allow for rail expert Bob Pixton to provide well informed captions and text in this fascinating new title. Following in the 'Steam Trails' style format this new title includes informative text and highly descriptive captions allied to a variety of mono and colour photographs. An excellent addition to any rail enthusiast's collection!